01.07.18 Mr Shao Changzhuan, CUHK PhD student, was awarded a "Special Contribution Award for Bamboo Architecture at the 1st Global Bamboo and Rattan Congress. Please click here to see details and photo (in Chinese version only. 24.04.18 1U1V team built the longest bamboo bridge in the rural mainland. The bridge, measuring 21 metres long, was completed in April 2018 at Dujia Village in the Yubei district in Chongqing. It marks a breakthrough in modern bamboo bridge building. Please click here to see relevant press release. 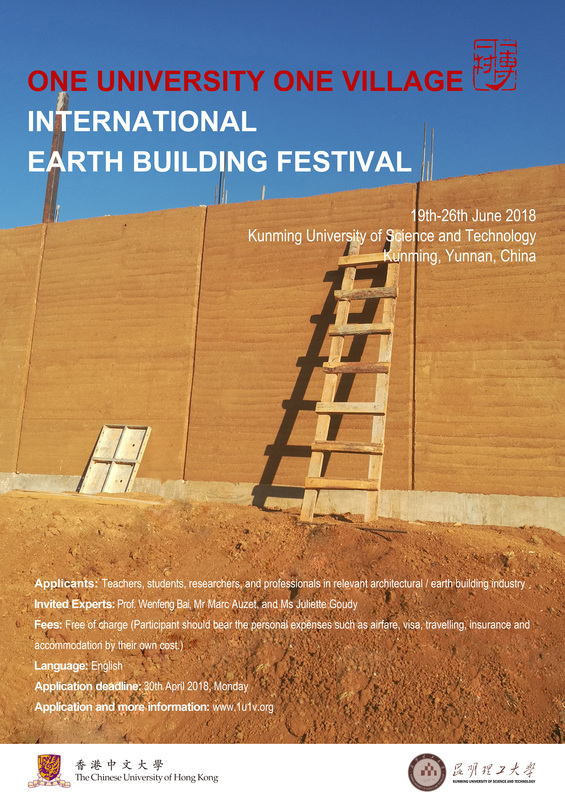 20.03.18 1U1V team is now calling for application to participate in the First International Earth Building Festival being held in Kunming University of Science and Technology on 19-26 June 2018. Participants will learn earth building techniques from the invited experts. Please click here for more enrollment details and here for the recruitment poster. 02.03.18 1U1V team won WAN Awards 2017 - WAN Residential Award by ‘Post-earthquake Reconstruction Demonstration Project of Guangming Village'.Please click here to see the relevant awards result. 18.12.17 1U1V team won Local Grand Prize Award of the CIC Construction Innovation Award 2017 by ‘Post-earthquake Reconstruction Demonstration Project of Guangming Village'.Please click here to see project brief. 04.12.17 Please click here to see interview ── 萬麗：服務農村的「草帽建築師」 (chinese version only). 20.11.17 1U1V team won the prestigious World Architecture Festival Building of the Year 2017 by the project ‘Post-Earthquake Reconstruction and Demonstration House in Guangming Village, Yunnan'. Please click here to see result annoucement detailsand here to see relevant press release. 11.07.17 1U1V team won AR House Award 2017 by the project ‘Post-Earthquake Reconstruction and Demonstration House in Guangming Villager, Yunnan'. Meanwhile, the project has been also shortlisted in 2017 World Architecture Festival in the "New & Old – Completed Buildings" category. Please click here to see result annoucement details and here to see relevant press release. 06.06.17 Mr Shao Changzhuan, CUHK PhD student, won a prize in University Student Bridge Design Competition. Please click here to see details and photo (in Chinese version only. 20.09.16 1U1V team has recently got the generous donation of HK$20 millions from Chan Cheung Mun Chung Charitable Fund to support the setting up of research center in Yunnan, long-term research and technology innovation, local contractor training and development of more village projects so that we can promote new rammed earth building systematically and strategically. Please click here to see photo. 04.08.16 1U1V team has built the first modern bamboo bridge—Yi Xin Qiao— in the Xiaowu Village, Chongqing in July. 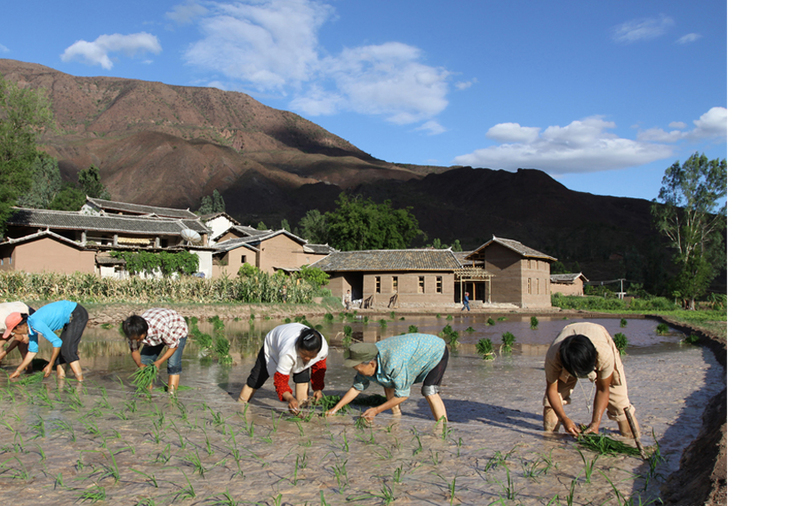 It eliminates the difficulties and danger impoverished villagers face when they cross the river. Please click here to see relevant press release. 01.05.16 After the revist trip to Dangzheng Village in Dec last year, 1U1V project team made an improvement plan for the bridge. During the period from 24 Apr to 26 Apr, total 11 teacher and student volunteers from CUHK and Xian Jiaotong University visited the village again and carried out repairing and improvement works for the bridge and kiosk. Please click hereto see the work and photos. 21.12.15 Project team and 5 students from Xian Jiaotong University conducted a revisit trip to Dangzheng Village in mid Dec. They assessed the condition of the bridge and made simple improvement work for the memorial kiosk. The bridge project was led by CUHK team and built in 2013. Please click here to see photos. 20.04.15 1U1V project team is organizing a "建構—建造" workshop with Kunming University of Science and Technology from 24 May to 31 May. Now, we are recruiting current CUHK Arch students to join. Please click here to download the poster for more details.